It has been a really long time since I’ve posted a card! Whew! So here is a penguin card to make things right! This is a Cat’s Pajamas set I’ve had for a long time, but the snowflake topper is brand new, at least to me! The TCP Tuesday Challenge #280 is to use a color palette of red, black and Kraft. I embossed the penguin stamp and then colored the image with Sakura Metallic Gelly Roll pens. I popped up the sentiment, repeating the circle and the snowflake motifs. Just for fun, this is also a stop on the Cat’s Pajamas’ Winter Blog Hop. Thanks for stopping by and I’ll try not to take so long for my next post! 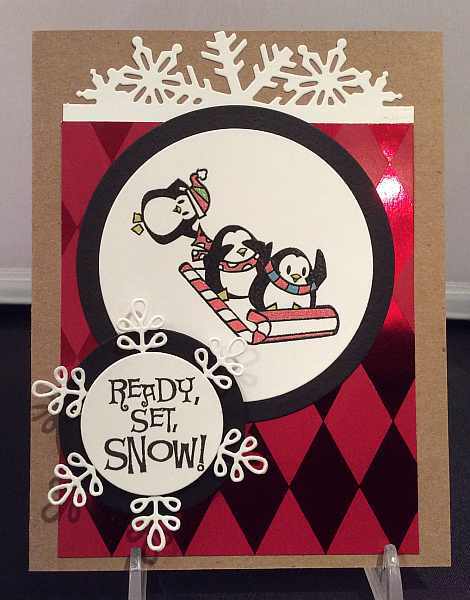 This entry was posted on Sunday, November 30th, 2014 at 9:59 pm	and tagged with cardmaking, Cat's Pajamas, die cuts, penguins, Simon Says Stamp and posted in Challenges, Christmas, TCP. You can follow any responses to this entry through the RSS 2.0 feed. What a fun card Yvonne. Love the white topper combined with that pretty red paper. Thank you for joining The Cat’s Pajamas challenges. Okay, I think I am in love with this card. The use of the colors is just wonderful. Congrats! I just saw your card on TCP and just knew it was yours! I’m helping some friends with cards and was looking for inspiration. Yes, yours is inspiring! Miss you!